Analysing centre backs is a subject likely to provoke either a shrug or a wistful smile from an analytics practitioner. To varying degrees, there are numbers and metrics aplenty for other positions but in public analytics at least, development has been limited and a genuine track record of successful application is yet to be found. If centre back analysis is the holy grail of public football analytics, then the search thus far has been more Monty Python than Indiana Jones. One of the major issues with centre back analysis is that positioning isn’t measured directly by on-ball event data and any casual football watcher can tell you that positioning is a huge part of the defensive art. Tracking data would be the ideal means to assess positioning but it comes at a high-cost both computationally and technically, while having a much smaller coverage in terms of leagues than simpler event data provision. StatsBomb’s new pressure event data serves as a bridge between the traditional on-ball event data and the detailed information provided by tracking data, offering a new prism to investigate the style and effectiveness of centre backs. While it won’t provide information on what a defender is up to when he is not in the immediate vicinity of the ball, it does provide extra information on how they go about their task. Starting at the basic counting level, centre backs averaged six pressure actions per ninety minutes in the Premier League last season. Tackles and interceptions clock in at 0.8 and 1.3 per 90 respectively, which immediately illustrates that pressure provides a great deal more information to chew on when analysing more ‘proactive’ defending. I’m classing clearances and blocking shots as ‘reactive’ given they mostly take place in the penalty area and are more-directly driven by the opponent, while aerial duels are a slightly different aspect of defending that I’m going to ignore for the purposes of this analysis. The figure below maps out where these defensive actions occur on the pitch and is split between left and right centre backs. Pressure actions typically occur in wider areas in the immediate vicinity of the penalty area, with another peak in pressure just inside the top corner of the 18-yard box. This suggests that centre backs don’t engage too high up the pitch in terms of pressure and are generally moving out towards the flanks to engage opponents in a dangerous position and either slow-down an attack, cut down an attackers options or directly contest possession. Maps illustrating the location of pressure actions, interceptions and tackles by centre backs in the 2017/18 EPL season. Top row is for left-sided centre backs and the bottom row is for right-sided centre backs. The location of pressure actions is somewhat similar to the picture for interceptions, although the shape of the latter is less well-defined and tends to extend higher up the pitch. Tackles peak in the same zone just outside the top corners of the penalty area but are also less spatially distinct. Tackles also peak next to the edge of the pitch, a feature that is less distinct in the pressure and interception maps. The number of pressure actions a centre back accumulates during a match will be driven by their own personal inclinations and role within the team, as well as the peculiarities of a given match and season e.g. the tactics of their own team and the opposition or the number of dangerous opportunities their opponent creates. The figure below explores this by plotting each individual centre back’s pressure actions per ninety minutes against their team name. The team axis is sorted by the average number of pressure actions the centre backs on each team make over the season. Pressure actions per 90 minutes by centre backs in the 2017/18 EPL season (minimum 900 minutes played) by team. Team axis is sorted by the weighted average number of pressure actions the centre backs on each team make over the season. At the top end of the scale, we see Arsenal and Chelsea, two teams that regularly played a back-three over the past season. Nacho Monreal and César Azpilicueta led the league in pressure actions per ninety minutes by a fair distance and it appears the additional cover provided by playing in a back-three and their natural instincts developed as full backs meant they were frequently putting their opponents under pressure. Manchester United top the list in terms of those predominantly playing with two centre backs, with all of their centre backs applying pressure at similar rates. At the other end of the scale, Brighton and Leicester’s centre backs appear to favour staying at home in general. Both though are clear examples of there being an obvious split between the number of pressure actions by the primary centre backs on a team, with one being more aggressive while the other presumably holds their position and plays a covering role. This division of roles is perhaps most clearly demonstrated by Chelsea’s centre backs, with Azpilicueta and Antonio Rüdiger as the side centre backs being more proactive than their counter-part in the central defensive slot (Cahill or Christensen). Liverpool’s improved defensive performance over the course of the season has been attributed to a range of factors, with the signing of Virgil Van Dijk for a world-record fee garnering much of the credit. Intriguingly, his addition to the Liverpool backline has seemingly offered a significant contrast to the club’s incumbents, who all favoured a slightly greater than average number of pressure actions. Furthermore, Van Dijk ranked towards the bottom of the list in terms of pressure actions for Southampton (4.5 per 90) as well, with his figure for Liverpool (3.7 per 90) representing a small absolute decline. As an aside, Van Dijk brings a lot to the table in terms of heading skills, where he ranks highly for both total and successful aerial duels, so he is still an active presence in this aspect, while being a low-event player in others. Centre backs are often referred to as a partnership and the above illustrates how defensive units often setup to complement each others skill sets and attempt to become greater than the sum of their parts. Mark Thompson has led the way in terms of public analytics work on centre backs and has advocated for stylistic-driven evaluations as the primary means of analysis, which can then be built on with more traditional scouting. Pressure actions add another string to this particular bow and the figure below contrasts the three proactive defensive actions discussed earlier. Players in different segments of the triangle are biased towards certain actions, with those in the corners being more strongly inclined towards one action over the other two. 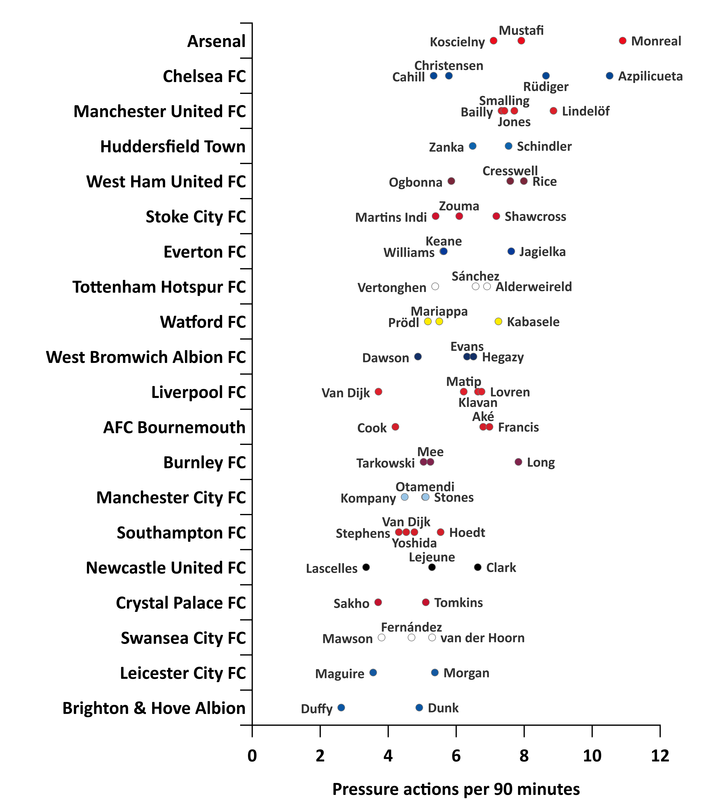 Comparison of player tendencies in terms of ‘proactive’ defensive actions in the 2017/18 EPL season (minimum 900 minutes played). Apologies for triggering any flashbacks to chemistry classes. Click figure to open in new window. There is a lot to pour over in the figure, so I’ll focus on defenders who are most inclined towards pressure actions. One clear theme is that such centre backs frequently featured on the sides of a back-three. Ryan Shawcross is unusual in this aspect given he was generally the middle centre back in Stoke’s back-three, as well as the right centre back in a back four. Ciaran Clark at Newcastle and Kevin Long at Burnley are the only players who featured mostly as one of two centre backs, with their partner adopting a more reserved role. The additional cover provided by a back-three system and the frequent requirement for the player on the flanks to pull wide and cover in behind their wing-back seemingly plays a large part in determining the profile of centre backs. This illustrates the importance of considering team setup in determining a defenders profile and should feed into any recruitment process alongside their individual inclinations. 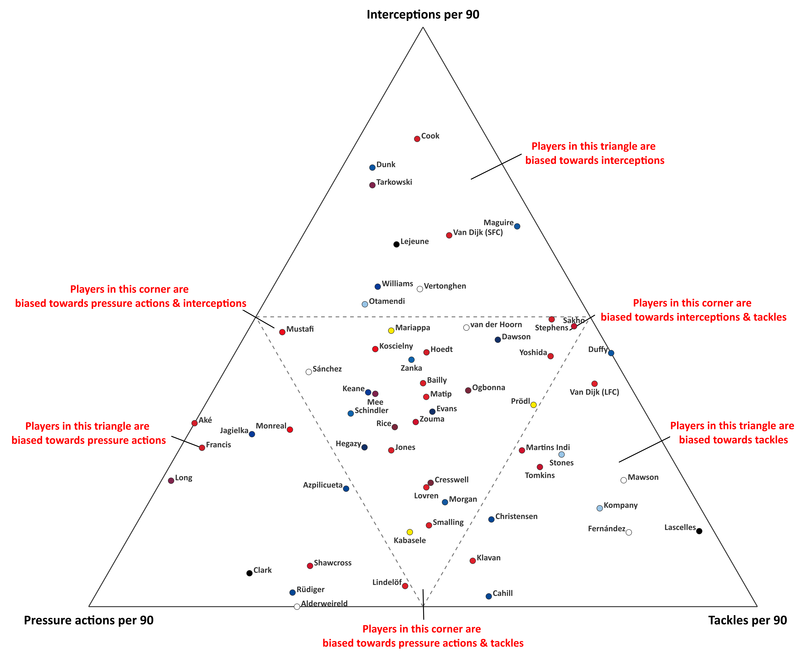 The analysis presented provides descriptive metrics and illustrations of the roles played by centre backs and is very much a first look at this new data. While we can’t gain definitive information on positioning without constant tracking of a player, the pressure event data provides a new lens to evaluate centre backs and significantly increases the number of defensive actions that can be evaluated further. Armed with such information, these profiles can be built upon with further data-driven analysis and combined with video and in-person scouting to build a well-rounded profile on the potential fit of a player. Now all we need is a shrubbery. This entry was posted in Centre Backs, English Premier League and tagged Centre Backs, English Premier League, EPL by Will Gurpinar-Morgan. Bookmark the permalink.